Not much happened at day one of baseball winter meetings between the clubs, but the big announcement came with Greg Maddux announcing his retirement. 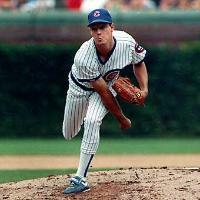 Maddux retires with 355 wins and 4 Cy-Young awards. Maddux was 26-20 with a 2.84 ERA against the Cardinals. There is only one team that he has never faced…do you know who it is? As far as the Royals and Cardinals. With the Royals trading reliever Leo Nunez and Ramon Ramirez for two everyday position players, GM Dayton Moore is now looking for a couple of right handed relievers. Two names they’re talking with. Kyle Farnsworth who pitched with the Tigers and Yankees recently and former Cardinal Russ Springer. The Cardinals have four left handed hitting outfielders in their organization and could certainly trade any one of them for left-handed pitching. Chris Duncan, Rick Ankiel, Skip Schumaker, or prospect Colby Rasmus are all on the table and could go, but as for now it appears as though GM John Mozeliak is in a wait and see mode this week. Back to my trivia question. The only team Greg Maddux has never faced? The Kansas City Royals. With interleague play, there were a couple of American League teams he’s only faced one, but never the Royals.